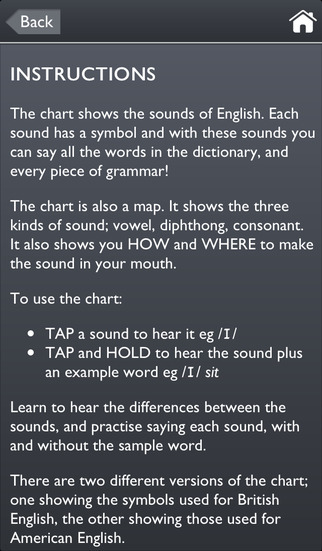 The ultimate mobile English pronunciation aid, for both students AND teachers. Sounds helps you study, practise and play with pronunciation wherever you are. This free version includes Interactive Phonemic Charts for British English and American English. Tap to hear a sound, or tap and hold to hear the sound and an example word. In the Premium version (now available) you can look up, listen to and record words in the WORDLIST; PRACTISE your pronunciation skills; test yourself with the pronunciation QUIZZES; use the phonemic TYPEWRITER; and LEARN with Top Tips, videos and more!